Who Run The World? GIRLS! LADIES! 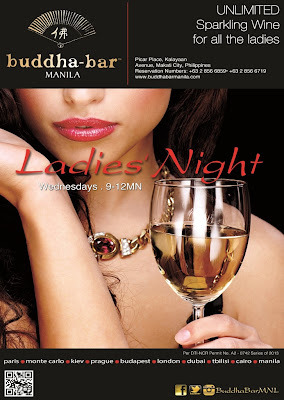 The hip and hot party spot in the metro, Buddha-Bar Manila, celebrates girl power every Wednesday night as they launch their very own, Ladies Night! The weekday warrior women are in for a special, ladies only treat on Wednesdays only at Buddha-Bar Manila. Metro ladies are exclusively invited to party the night away with overflowing, unlimited, and best of all, FREE sparkling wine from 9PM ‘til 12 midnight. The Wednesday Ladies Night asks NOTHING from the hardworking gals, just simply come, bring your friends, and enjoy girls’ night out only at Buddha-Bar Manila.